Disclosure: I participated in a campaign on behalf of Mom Central Consulting (#MC) for Mom Corps YOU. I received a free trial to facilitate my review and a promotional item as a thank you for participating. "Mom Corps, a national award-winning professional talent acquisition and career development firm, has launched Mom Corps YOU, an online community to help professionals better integrate their professional and personal lives." It only takes a few seconds for someone to form a first impression of you? Do you have what it takes to WOW at your next (and maybe first in a long time) job interview? While I am still a year or two off from heading back into the workplace, once the girls go to school, I am brushing up now on my interviewing skills, as well as working to create a personal brand, thanks to the wonderful tips, tricks and resources I have found through the Mom Corp YOU website and online webinars I have been attending these past few months. In addition to gaining insightful information like how to define your brand, which I will share more about in a second, I have loved being able to share all the great innovations and resources Mom Corps YOU has to offer during my partnership with them recently. From my post back in March about Jean Chatkzy's webinar about becoming a savvy saver, along with planning better financially for my family to my post about the "Resumes that Get Results: A Three-Step Resume Workshop" webinar I sat in on in mid February, I can't stop raving to family, friends and my online readers about how great Mom Corps YOU is for moms. "When looking to re-enter the work force or increase your hours from part-time to full-time, making a strong first impression in person and on paper helps get you off on the right foot with potential employers. Mom Corps YOU offers tools to help you revamp your resume, build a personal brand, answer questions about time out of the workforce, find a position that will work with your flexibility needs, and reignite your career." 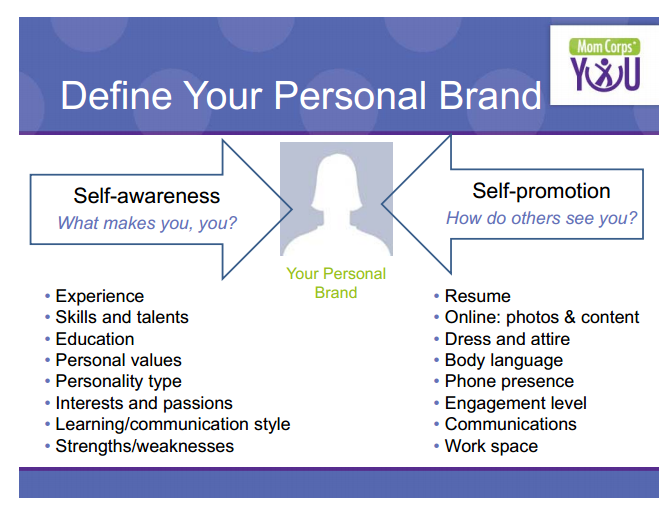 Like I shared in my Mom Corps YOU post last month, I missed an April webinar about personal branding. But, because they record and archive their speaker's talks, I was able to watch it at a later, more convenient time. I am so glad I made time to watch this webinar in its entirety because I learned so much. "Personal brand is what people say about you when you leave the room. 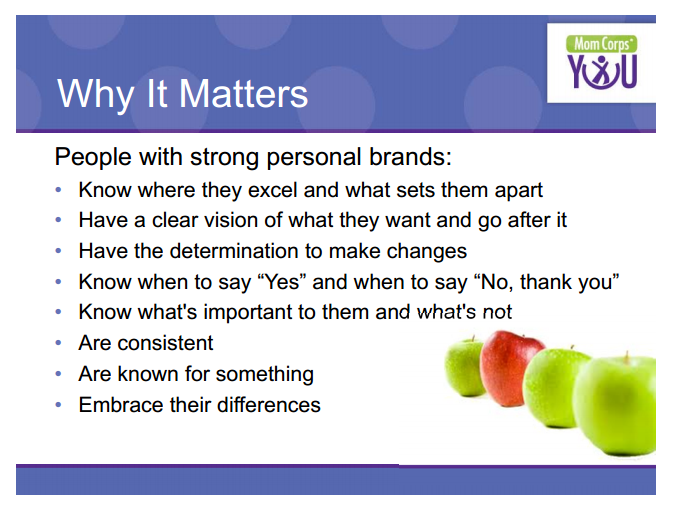 In this webinar, job seekers learn why a personal brand is important, how to get started defining your personal brand, a simple framework to approach personal branding and ideas to act on immediately following the webinar." I found myself going crazy taking notes on this webinar. I didn't want to miss word of this amazing "personal branding" talk. I personally found the "Steps to Personal Branding" the highlight of the talk, as it really got me thinking about my personal brand and how I have to work at defining it better, along with working on my elevator pitch, so that others see ME and what I have to offer. 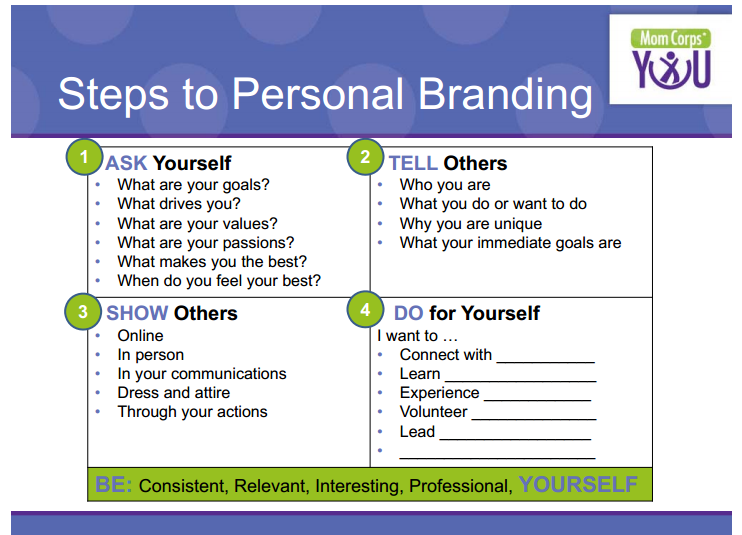 I was left with homework after this webinar, and have to say it really made me take a step back when I was trying to answer the different questions posed, to help define my personal brand, which one continually has to work at and improve. I liked how you the speaker, Renee Spurlin, who is also the Marketing Director for Mom Corps YOU, kept reminding you to "BE Consistent, Relevant, Interesting, Professional, YOURSELF." Out of all the recent Mom Corps YOU webinars I have participated in, I have to say that this one was really motivated me and make me think about how I want to portray myself when the time comes to re-enter the workplace, but also right now, while being a blogger and working with different companies and vendors. During the month of May, Mom Corps YOU has been offering and has some amazing great speakers lined up, to help those looking to re-enter the workplace. From helping you prepare for making a good first impression, to dressing right for your interview, and even preparing your resume on social media (a webinar I signed up for that will be taking place on May 22nd online), Mom Corps You is here to help women feel more confident about returning to the workplace after taking time off to raise their family, or entering it for the first time. ‘Transform Your Resume on Social Media’ webinar to learn how to enhance your online reputation to help you find your next job. Professional writer and editor Eboni Thomas will share how to use your resume to fortify your online presence. You’ll learn how to repurpose the content of your resume to fortify your LinkedIn profile. She’ll also share some “tweet” tips on using Twitter for your career search. I am super excited about Eboni's upcoming webinar and know I will gain some amazing insight into utilizing my Linkein and Twitter contacts to help me in my upcoming job search. Maybe your family has suffered financial hardship you need to help by finding a job. Do you know where to start? Is your resume (if you have one) up-to-date? What about dressing for an interview? What are people wearing nowadays, and what is considered professional enough, especially for a first interview and first impression? Leave it to the folks at Moms Corp YOU and their amazing guest speakers and online resources, to help make your entry into the workplace a little less stressful, while also giving you a leg up on the competition thanks to their tips and resources made available to members of this wonderful online community. It's an unquestioned truth of modern life: everyone is starved for time. With extreme jobs, two-income families, and the ability to log on 24/7, we tell ourselves there's barely time to breathe. We'd like to advance our careers, give the people we love our best, and maybe get to the gym, but then we give up because there aren't enough hours in a day. And maybe there aren't in a day. But what if we look at a week? In this fast-paced and research-based workshop, Laura Vanderkam argues that in the whole of 168 hours, there is plenty of time to build a rewarding career, nurture your relationships, and pursue your own passions. After exploring research into time use, Laura gives a few key exercises to help you take control of your hours, pursue what really matters, and use any bits of time for bits of joy. Recruiters are strategic partners in your career search. Learn more about the recruiter relationship and how to effectively work with them as well as inside knowledge and advice to apply during your job search, interview process and selection decision. OWN YOUR CAREER: RETURNING TO WORK LATER? WHAT TO DO NOW. Are you taking some gap years and considering a return to work at some point? Does the thought of re-launching your career make you feel excited, overwhelmed or lost? Don't miss this session where we cover the latest information on career pre-launch, creative strategies for keeping a toe in the water and how to address those tough questions. In addition to preparing to re-enter the workforce, you can find other valuable information at Mom Corps You including how to balance work and family life, how to become financially savvy, stress busters, retirement planning, and so much more. So, what are you waiting for? Head on over to the Mom Corps You website today and sign up to become a member and start taking advantage of the resources available, including webinars, handy printouts, checklists and more. Mom Corps YOU is available via an online subscription for an introductory annual price of $99.99 or $19.99 a month.